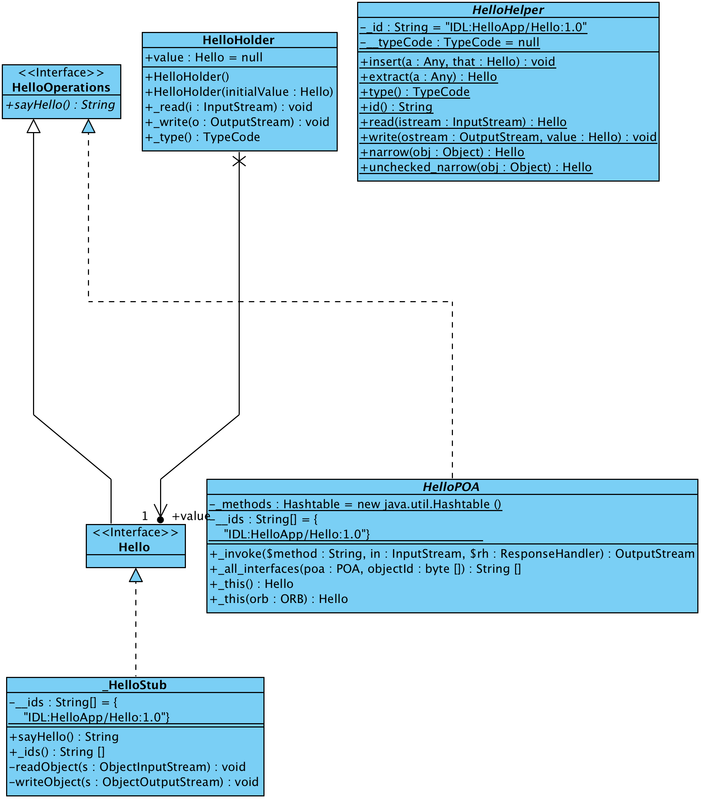 In this article, I’d like to introduce to you the Common Object Request Broker Architecture, which is abbreviated as CORBA1, and its implementation in Java, which is named Java RMI-IIOP. You may think the CORBA is an outdated technology, actually it is still acting as the the basic architecture of distributed object invocation field. Many of state-of-the-art projects are built on top of CORBA. For example, Narayana, the transaction processing project provided by JBoss community, use many idl files to describe its OTS implementation interfaces. Narayana is acting as the transaction processing subsystem in Wildfly2. Java RMI3 is an distributed object invocation solution provided from Java community, and it was then enhenced by the RMI-IIOP standard to fully compliant with the CORBA standard. Because CORBA provides platform independency, so the Java RMI-IIOP allows the Java applications to communicate with the systems that conforms to the CORBA that is not written in Java. The CORBA and Java RMI-IIOP technologies are usually hide from the application level to the end users, but they are broadly used in middleware level as implemenations of remoting and transaction processing subsystems. In this article, I’d like to give you an introduction on these technologies. First let’s learn how to write a CORBA application. 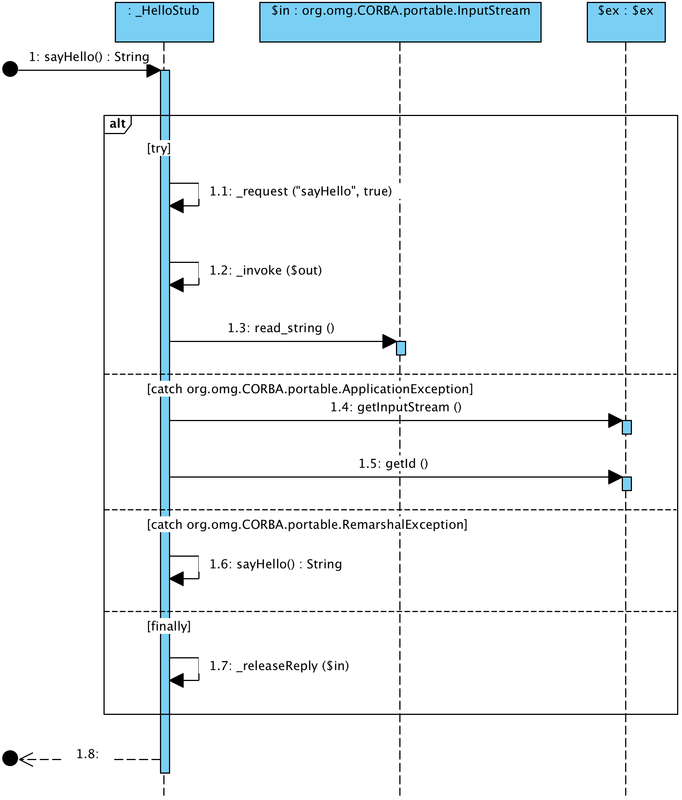 In this section, we need to know that CORBA uses a platform independent description language called IDL4 for the users to describe their application interfaces. The fullname of IDL is Interface description language, and its grammar looks like C++ language but it’s not the same. Java has an IDL compiler called idlj that can compile the IDL file into Java classes. 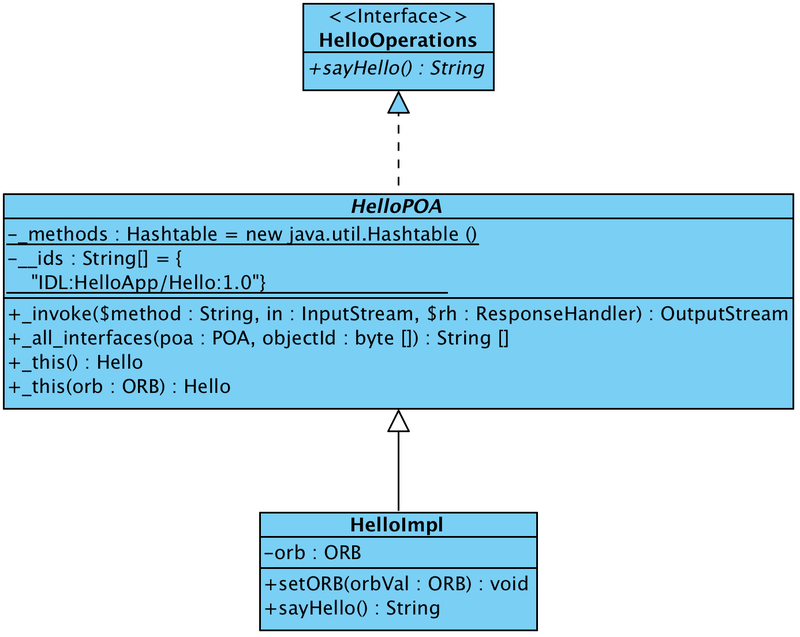 In this section, we will write an Hello interface using the IDL format, and then we will use the idlj compiler to compile it to Java classes. The first step is to write the IDL file to descibe our application interface. The above interface is named Hello, and it contains a sayHello() method that will return string typed data. Now we can use the idlj compiler to compile it. The above command output shows the classes that is related with the client side. Before explaining these classes, we need to have an understanding on the basic CORBA architecture. Generally speaking, CORBA divides the whole system into three parts: The naming service; The client side; The servant side. Firstly, we need to know CORBA is a netword based architecture, which means the three sides can be located at different places. The servant side acts like a server that accepts the calls from clients, and the client side will make the calls to the servant side. The naming service is used for the servant side to register the service it provides, and the client side will fetch the servant information from the naming service. The naming service is usally a server that listens to network for the servants to register/unregister themselves, and for the clients to fetch the servants information that they need. 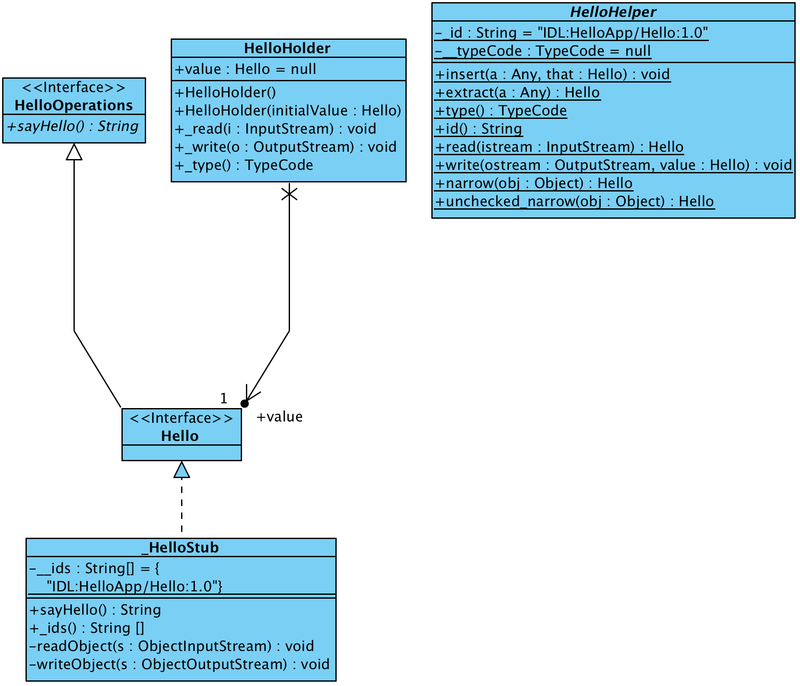 From the above code we can see the org.omg.CORBA.Object typed parameter is cast to HelloApp.Hello typed return value. We will use this narrow(...) method later. That’s all I’d like to explain for client side. The next step is to generate the servant side classes. From the above diagram, we can see the relationship between these classes, and we can see the shared classes between client side and servant side. Nevertheless, these classes can not form a complete client or servant yet. We need to implement some client side and servant side classes by oursevles. Now let’s implment the servant side implementation of the Hello interface. * Created by weli on 25/04/2017. As the above code shows, the servant manager is in rootpoa, and it’s retrieved by ORB from naming service. The name of the POA object in naming service is RootPOA. This is the architecture defined by CORBA specification. There is a naming service for the servants to be registered and fetched. For example, our HelloImpl can be registered into the naming service. The naming service is provided by naming server. In this article, I’ll use a tool provided by JDK named orbd for this purpose. It is a CORBA naming service daemon provided by JDK. From the above code, we can see that we use orb to get NameService itself from naming service, and then we register our HelloImpl as Hello service. In above code, the last line will put the servant into listening status, and it will start to listen for requests from clients via network. As we have prepared the servant side, now we need to implement the client side. The above code is simliar to the process of getting NameService in above. We use ncRef.resolve_str(...) to fetch the remote object from naming server. If we check the type of helloImpl, we will see the type is _HelloStub, and this class will handle the network communication with server side. When we call helloImpl.sayHello() method later, the stub will actually invoke the HelloImpl.sayHello() implementation at servant side. Now let’s check how does servant side receives the call from client side and processes the request. From the above seqeuence diagram, we can see how does servant side deal with the requests from the client side. To sum up, here is the description of the whole process: Firstly, there is a naming service daemon started that allows multiple servants to be registered and client can fetch the servant from the naming service. Secondly, we register our HelloImpl servant into the naming service, and the service name is set to Hello. The client side fetches the Hello servant from the naming service, and knows the network location of the Hello servant. Then the client side invokes a request by using the Hello.sayHello() method. This is done via the _HelloStub class. The _HelloStub class deals with the network communication with the servant side. 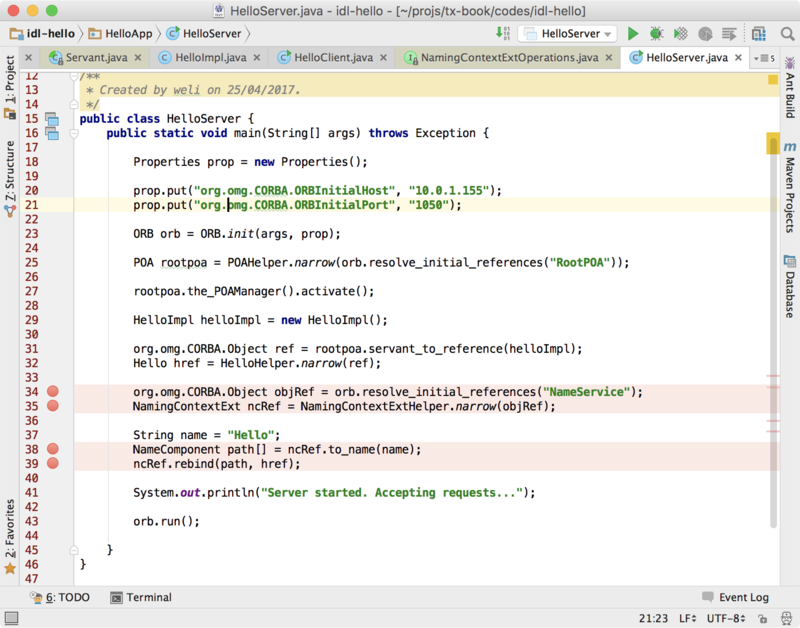 The servant side used HelloPOA class to deal with the request from client side. It invokes the sayHello() method in HelloImpl, and then marshal the return message and send back the message to client side. 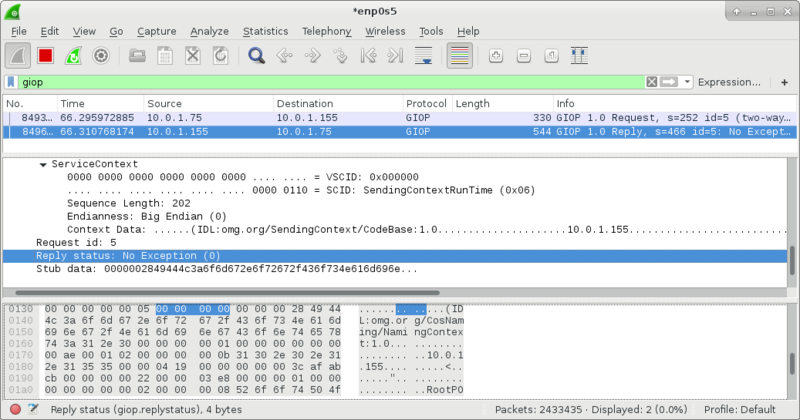 Thirdly, the client side receives the the network data reply from the servant side, and remarhal the data as the return value of the sayHello() method of Hello interface..
From the user’s perspective, the client side invokes Hello.sayHello() method as if it’s a local method call, but actually it is a remote call to the HelloImpl.sayHello() in a servant. The network communication and server implementation details are hidden to users. This is one of the design purposes of the CORBA architecture. In addition, the client side, servant side and naming service side are independent from each other. Now let’s deploy our whole project into running state. From the above diagram, we can see the three sides will be deployed into different machines and they are connected by the network. That is what I’d like to show you in this section. I will start the orbd on machine A. The servant that has HelloImpl will be deployed on machine B, and it will register itself into the naming service on machine A. At last I will deploy the client on machine C. The client side will fetch the Hello servant from naming service. The naming service will tell the client side that the Hello servant is on machine B, and then the client will make a remote call to the servant on machine B. Now let’s take the first step: starting the orbd on machine A. As the command shown above, we have started the naming service daemon on machine A. The ORBInitialHost option defines the hostname or IP address that orbd will listen to. Because the public IP address of machine A is 10.0.1.155, so the option is set to it. the ORBInitialPort option is used to set the port that orbd will allow servant or client to fetch the NameService. NameService is the default service provided by orbd, and servanta need to register itself into it. Meanwhile the client also need to fetch servants from NameService. Please note orbd has another port called activation port which accepts multiple commands to operate on servants. We will check the details later. The default port for activation is 1049. Please make sure you have configured your firewall properly so the communication between three machines are not blocked. I recommend you to turn off the firewall on machine A, B, C for testing purpose. Next we should register our HelloImpl servant on machine B to the naming service on machine A. 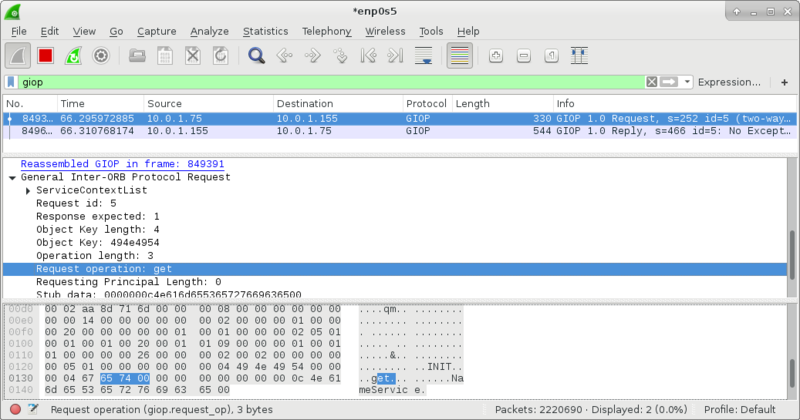 From the above diagram, you can see I have applied a filter that will only show GIOP packets. GIOP is the protocol used by CORBA to transfer data. 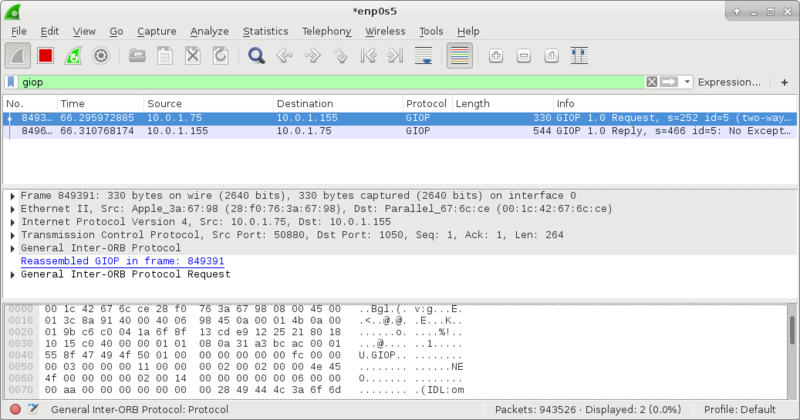 We can see the GIOP data is transferred via TCP protocol, and this is called IIOP. 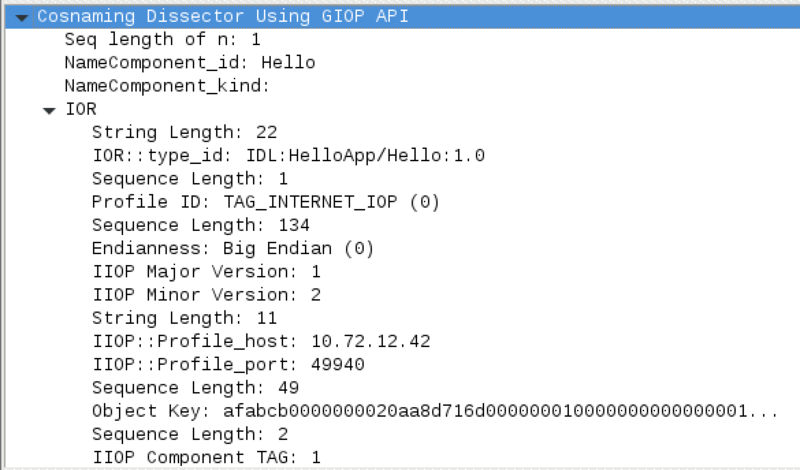 In a word, the GIOP data trasferred via TCP protocol is called IIOP. We can see the benefit to support a standard communication protocol in network level: Because Java RMI-IIOP standard supports the IIOP protocol, so it can interact with other systems with different language platoforms. Different language platforms just need to generate the interface from IDL file and make the invocation, and don’t need to worry about the detail implementation on the other side. From the above screenshot, we can see the information of the Hello servant has been registered into the naming service. The IP address 10.72.12.42 is another public IP of machine B, and later the client from machine C will fetch this info of Hello servant and use it to communicate with the servant on machine B. As the screenshot shown above, the servant is ready for accepting requests. We have analyzed the registration process of the servant to naming service, next we should start a client side call from machine C to see the network communication process. The client on machine C needs to communicate with the naming server on machine A to fetch the NameService, and then it will fetch the info of Hello servant from the NameService. After getting the info of Hello servant, it knows the servant server is located at machine B, and then the _HelloStub will communicate with machine B and remotely call the HelloImpl. In summary, client on machine C will firstly contact with the naming service on machine A, and get the info of Hello servant, and then it wil call the Hello servant server on machine B. 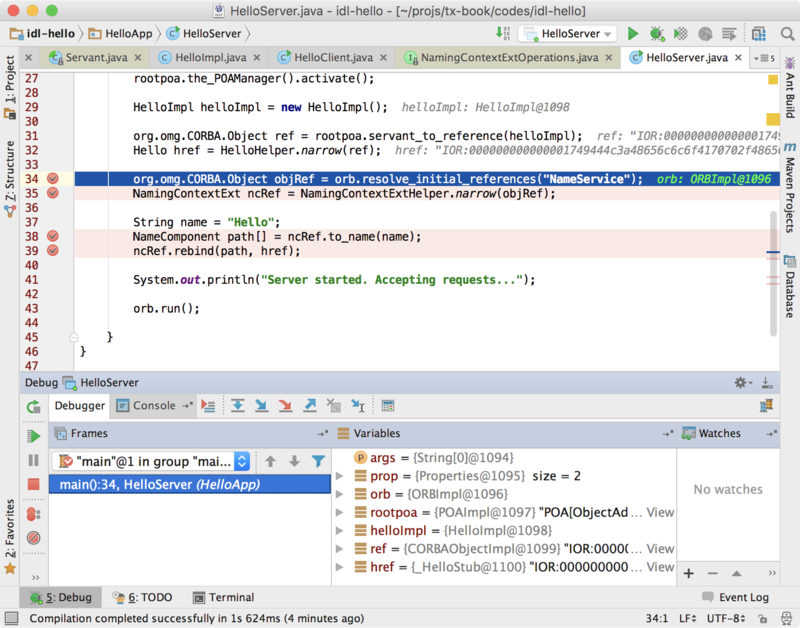 From the above screenshot, we can see client on machine A gets the result from HelloImpl.sayHello() method on machine C. From user’s perspective, it seems like the helloImpl.sayHello() is a local method call, but actually it is a remote call to another machine. What’s amazing is that we fetch the servant from an independent naming service on machine B, and we could easily change the servant in future, because some other servant can replace the Hello service by registering itself into naming server by using the same service name. This gives us great flexibility during our distributed service deployment. In this article, we have written a Java application with CORBA standard and Java RMI-IIOP implementation. We have seen the achitecture defined by the CORBA, and we see how does Java platform provides us multiple tools to write the application that conforms to the standard. The CORBA and Java RMI-IIOP standards are the basis of many modern application servers. I wish this article is a good start for you to dig deeper in this area in future.